The Baileys Horse Feeds Flexi Eventing League, organised by Eventing Ireland’s Northern Region in association with The Meadows Equestrian Centre, got underway at the weekend with £1,000 sponsorship from Baileys Horse Feeds, writes Dora Beacom. Although initially windy, the sun eventually made an appearance and it was generally a very pleasant day for the 350 competitors who travelled from all over Ireland for this inaugural training show. 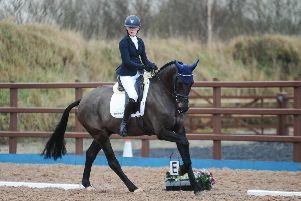 Large entries in the Intro dressage meant a class division and the combination which most impressed the Judge in the ‘A’ section, Stephen Murphy, was Lucca Stubington and Xanthe. In fact Lucca had an amazingly successful day as she also claimed third prize in the same section with Xavier and then picked up a second with Xenophon in the ‘B’ section under the watchful eye of Vanda Stewart. These three horses are all homebred. Xanthe and Xavier are both by Sir Shutterfly and are fourth generation of the illustrious Juniper Green’s family, on which Lucca’s mother, Georgia, won three Junior medals. Xenophon is by Diane Harron Eakin’s stallion, the very well respected, Ringfort Cruise. There must have been serious training going on in the McClean household all week as Suzi riding Simba took second place in the ‘A’ section while Gareth and Scooby picked up a fourth equal in the same class. Vanda Stewart reserved her top marks in the ‘B’ section for Robbie Collins and his very striking gelding, Dunrath Navigator. This rising five year old gelding is by a thoroughbred out of an ISH Cruising/Cloverhill mare. To come top of a competitive class on his first dressage competition speaks volumes for his future potential and, again, we look forward to following his progress. Top honours in a very heavily subscribed and competitive Pre Novice class, judged by Martina McKinley, were taken by Lucy Hanna and Brian who came in over one point clear of second placed Joanne Jarden and Quarryhill Calypso. Brian is a home bred and produced 6 year old gelding by September Storm and was an eventing winner in the EI 90 on his last outing at Loughanmore. Meantime, victory in the Novice class, judged by Janet Hall, went to Adam Haugh with his six year old Van Gogh gelding, Van Thee Man. Second place went to the accomplished duo of Denis Currie and his fourteen year old Shannondale Sarco St Ghyvan gelding, Arodstown Aramis. Izzy Riley and the seasoned Versace Biscuit took top spot in the Intermediate class with Daniel Brown and Euro Jackpot picking up second place. The show jumping arena was also very busy and continued unabated from just after 9am until after 4pm with a general consensus that a great education had been gained as horses and ponies experienced a superb selection of coloured poles and fillers. The cross country arena was filled with a fabulous selection of fences which gave competitors and their horses plenty to think about and provided a very valuable schooling opportunity at this stage of the year. Sincere thanks to the large team of helpers who ensured that the day ran seamlessly. The Flexi Eventing continues every Saturday until 2 March with points being awarded for performance and attendance with a special; prize for the highest placed Riding Club/Pony Club member. 70cms: Zoe Daniel, Buddy, Charlotte Cochrane, Tullymurry Abbie, Heather Smith, Kaz, Maeve Lunny, Jack, Luke Devlin, May, Matt Devlin, Sugar. 80cms: Kerry Parkhill, Elsa, Zara Keys, Joey, Caroline Stevenson, Bella, Ella Morrison, Indi, Helen Faulkner, Danny, Ruth English, Eagle, Rachel Ferres, Ace, Katie Clarke, Mulvin Blue Moon, Elizabeth Smith, Rocky, Erin Corbett, FoleyMandy McQuade, Rosie, Heather Beattie, Diamond Millie, Roisin Conway, Sasha, Jayne Robinson, Moonlit Ivy, Bernadette Muirhead, Hanslough, Sadie McMahon, Africa, Rachel Lockyear, Townhill Penny, Charlene Little, Sapphire. 90cms: Zara Keys, Fred, Maeve McCleary, The Rock, Robbie Collins, Dunrath Navigator, Sarah Brashaw, Out of the Phoenix, Taylor Hunter, Ferro, Claire-M aria Currie, Joey, Felicity Johnston, Black Arrow, Taylor Hunter, Magnum. 1m: John McEvoy, Jimmy, Sheena Kerr-McNally, Pegasus, Hugo O’Neill, Jude, Izzy Riley, Woody, Meabh McIlduff, Dalsown Done & Dusted, Lucy Hanna, Brian, Gwen Scott, Christie, Lauren Brooker, Barnfield Indian Sky, Jessica Nelson, Tai, Bethany Cardwell, Narnia Highlights, Ellen Douglas, Rock Melody, Emily Corbett, Trigger, Alex Ogle, Lilli, Judith Graham, Edentrillick Leviticus, Gwen Scott, Foxy, Rose de Montmorency, Frankie, Alex Watt, Drumrankin Alicia, Leah Knight, Belle, Leah Knight, Brealynn, Ann Bowe, Autumn Bee, Emily Corbett, Joey, Catriona Cody, Roisin McNamara, Admiran Tornado, Laura Sloan, quida, Rose de Montmorency, Ozzy. 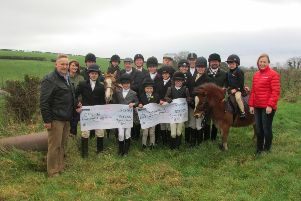 1.10m: Izzy Riley, Versace Biscuit, Michael McGaffin, Jimmy, Holly Boal, Bonmahon Flash, Nicci Hall, Casper, Catriona Cody, ruby, Beth Murray, Val de Mazeroy, Anita Doherty, Connor, erin Crawford, Foley, Connor Savage, Teddy. 1.20m: Johnny Mulligan, Rosetta, Nicci Hall, Baby G.
80cms: Charlotte Cochrane, Tullymurry Abbie, Suzi McClean, Simba, Gareth McClean, Scooby, Nicky Nesbitt, Carrickview Saratoga, Nicky Corr, Armpit, Helen Faulkner, Danny, Nicky Corr, Betsy, Lexi Kerr, Pepsi, Meadbh McKeag, The Rock, Roisin McNamara, Admiran TornadoElla Morrison, Indie, Orla Cusack, Poppy, Heather Beattie, Diamond Milly, Eoghan Devery, Inish Flight, Roisin Conway, Sasha, Lynn Spence, George, Fergus McGirr, Ruiari, Katie Clarke, Mulvin Blue Moon, Kitty Cullen, rocky, Nicola Martin, Butter, Neil Habbard, Maggie, Beth Smyth, Golden grove Royal Wedding, Kate Russell, Bingo, Melanie Talbot, Calypso, Karen Glendinning, Golden Grove, Sophie Morrow, Silver Boy, Margaret Creighton, Dolly, Katie Wray, Easy Dun. 90cms: Evan Hobson, Promise Me, Barbara Johns, John Rambo, Carly Douglas, Milo, Laura Kelly, Drumcaughey Diamond, Liz Wilson, Snowball, Wendy Kirk, Bear, Sophie Cavan, Tempo Quickstep, Caitie Slater, Yogi, Amy Smyth, Highland Ruth, Katie Smyth, Glenmore Mirah Patrick, Lauren Brooker, Barnfield Indian Skye, Aislin Captain, Apache Feather, Carly Douglas, Milo, Nicky Potter, Lily, Izzy Riley, Woody, Robbie Collins, Dunrath Navigator, Sarah Kee, Nonavic Kismet, Ann Bowe, Autumn Bee, Shane McKeever, KHS Impact, Kate Russell, Bingo, Leah Knight, Z, Leah Knight, Bennie, Leah Knight, Wolf, Felicity Johnston, Black Arrow, Conor Findlay, Wise Guy Duke. 1m: Gemma Goodrich, Lisnamuck What A Cracker, Meabh McIlduff, Dalsown Done & Dusted, Lucy Hanna, Nelly, Beth Murray, Val de Mazeroy, Hannah Burns, TJ, Leah Knight, Milo, Hugo O’Neill, Jude, Nicky Nesbitt, Ringfort India, Gemma Chambers, Blue Oak Harry, Sheena Kerr-McNally, Pegasus, Olivia Johns, Lagans Peter, Justine Harding.